Whether you’re driving into work during a storm or taking a family road trip to territories unknown, you can drive with peace of mind when you own a Nissan with all-wheel drive or four-wheel drive. The new and used Nissan SUVs and crossovers at our Nissan dealership near New Haven, CT, will be the perfect match for your everyday excursions, as they provide you with superior handling and traction when the going gets tough. Start shopping our inventory today to find your favorite AWD Nissan crossover or 4WD Nissan SUV! Which Nissan Vehicles Have All-Wheel Drive or Four-Wheel Drive? No matter which Nissan SUV or crossover it is that you covet, our staff will work hard to get you the keys with a payment plan that makes sense for you. 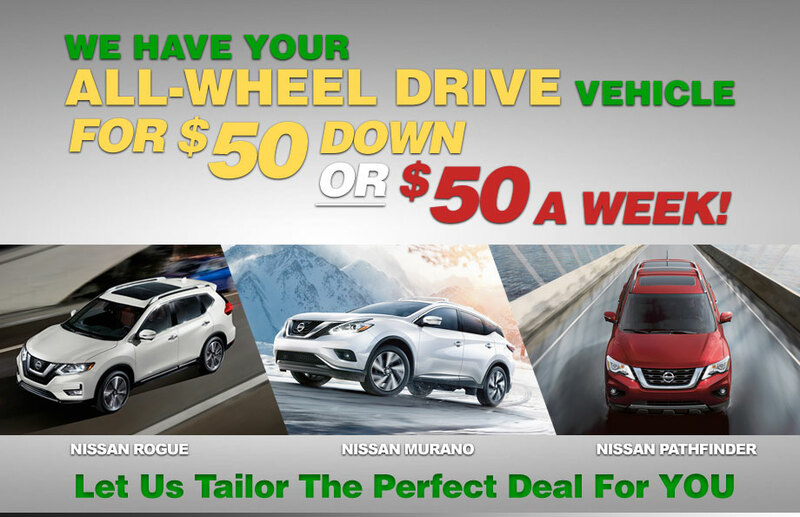 From the Nissan Rogue AWD to the four-wheel drive Nissan Pathfinder, we’ll surely have the right fit for your lifestyle and budget. The Pathfinder boasts the All-Mode 4×4-i intuitive 4WD system, which helps you conquer challenging terrain and rough weather with confidence. Opt for the Rogue all-wheel drive model and you’ll benefit from having the Intelligent All-Wheel Drive system. This Nissan AWD system sends power to both the front and rear wheels to ensure you have enhanced traction when taking tight turns and when you’re driving through snow, mud, rocks and more. Spring for the Nissan Juke AWD option and you can capitalize on the torque vectoring All-Wheel Drive system, which gives your crossover the verve and flexibility it needs to conquer any road you may encounter. Come visit George Harte Nissan today and explore our selection of both 4WD Nissan SUVs and all-wheel drive Nissan crossovers. We’ll get you behind the wheel of the right car in no time!